This morning the chicken coop was approved for occupancy. The visit from Marc Howell, Ferndale’s building inspector, was short and sweet. He immediately said it was a sturdy structure, and well weather-proofed. He asked about underground barriers, and I explained that we had buried cement pavers. If rodents or any other vermin make their way into the coop, he suggested burying wire mesh around the perimeter. Marc also noted that the coop was at least 10 feet from any other structure. I had meticulously measured the distance from the shed to the coop, but still was relieved when he said it looked good. Lifting the lid to the nesting box, he looked up, surprised to see I didn’t have any hens yet. I told him that we are picking up three chicks March 17. Because of this, Mark said he considered this to be a “rough approval.” Once he can come back and inspect the chicks — to make sure I only have three (the limit in Ferndale) and no roosters — he would give final approval. This should take place in early May. By then the chicks should be grown up enough to live outside, and hopefully big enough to tell if they are pullets or roosters. It’s a happy day on the homestead. Chicks are only six weeks away. Thanks Stacey! And I appreciate the head’s up about the “rough approval.” I was totally ready for it when it came. Next stop: Chicks on March 17. When do you get yours? I’ll be calling Uncle Luke’s in the last week of February to put in my order for an April pick-up date. So ours won’t be making it out into the coop until early June. That will give me a little more time to complete the odds and ends that I still need to get done before the chicks can move in. How great! I’m guessing our birds will transition outside around mid-May. I’m so excited. The chicks are just around the corner. I can’t wait to be a mother hen! I didn’t realize chicken coops need approval. good to know. Be sure to check with your local municipality. 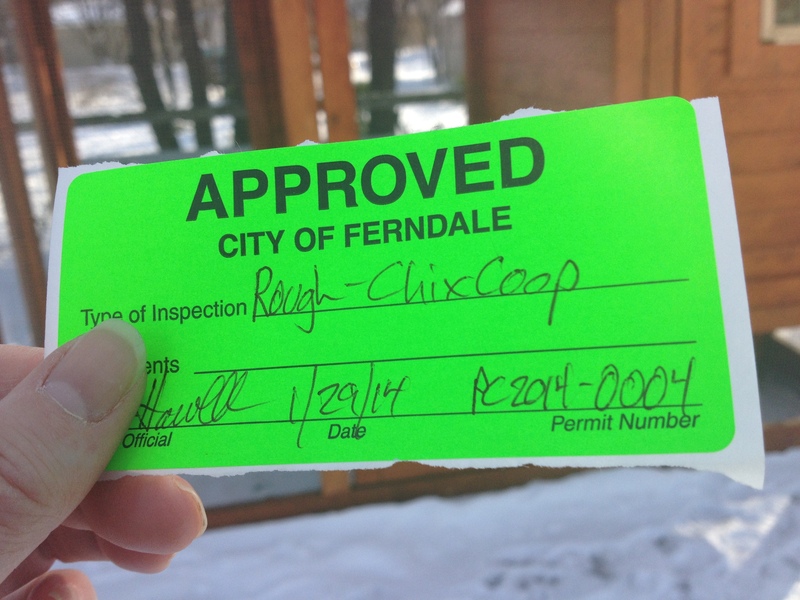 Here in Ferndale, Michigan, the city requires permits and inspections. However the requirements change from town to town. Good luck!